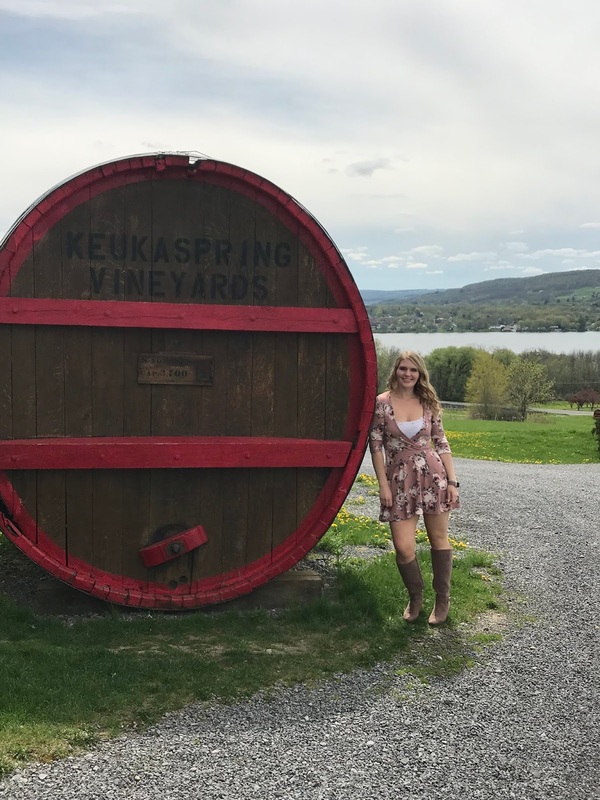 I have seriously fallen in love with visiting the Finger Lakes and wanted to share all the details of my last trip for anyone else who is considering visiting the area! My boyfriend and I made a trip last September for my birthday weekend (read about day 1 here and day 2 here). It was my second trip to the area and Will's first time visiting and he liked it so much that we planned another trip back at the beginning of May this year! We got up to the area by about 9PM and were not quite ready to just check into our hotel and go to bed...so we cruised around the town of Bath, NY which is right outside the town we were staying in on Keuka Lake looking for any place that was still open. One thing to take note of: the Finger Lakes area is a pretty QUIET area. Besides all the winery attractions, there are not a lot of other things going on! Not many places are open late. We found a restaurant online called "Liberty" that was supposed to be open late, but as we were walking around trying to find it we found The Office Bar in Bath instead. Now let me say this...if you ever find yourself ever staying on Keuka Lake I would not go out of your way to visit this local watering hole, but if you are up for a good time and meeting some locals, it's open late and fits the bill! We wandered in (we were literally greeted at the door by a man with one leg) and I was immediately worried about what I could find to drink (I don't like beer and most "townie style bars" serve really crappy cheap wine) but I forgot that I was literally in one of the best wine counties in America so even crappy townie bars serve good wine! I was so happy to get this tiny little bottle of local Finger Lakes wine after the long drive. We ended up hanging out for a bit and meeting some fun locals (the guy with one leg ended up being really nice haha. The grandpa wearing PJs who occasionally growled at people??? Not quite so much...) including the owner of the Liberty that we were looking for in the first place, so we decided to make sure we tried that spot out at some point on our trip. It was only a 10 minute drive to our hotel so we drove over, checked in, and got ready to start wine tasting on Friday! We decided to stay at the Best Western Plus in Hammondsport because it was affordable, clean and in a convenient location. I had stayed at VRBOs right on the lake my other two trips to the Finger Lakes and while those are often more scenic...I knew for this trip my boyfriend and I would be out and about most of the day visiting different places and not spending much time at the hotel, so it made more sense to just pick an affordable option. It ended up working really well: they had a yummy buffet breakfast that was included with the stay and so Friday we started with breakfast at the hotel where I may or may not have enjoyed a huge Belgium waffle with allll the topping. Had to carb up before drinking wine all day!!! 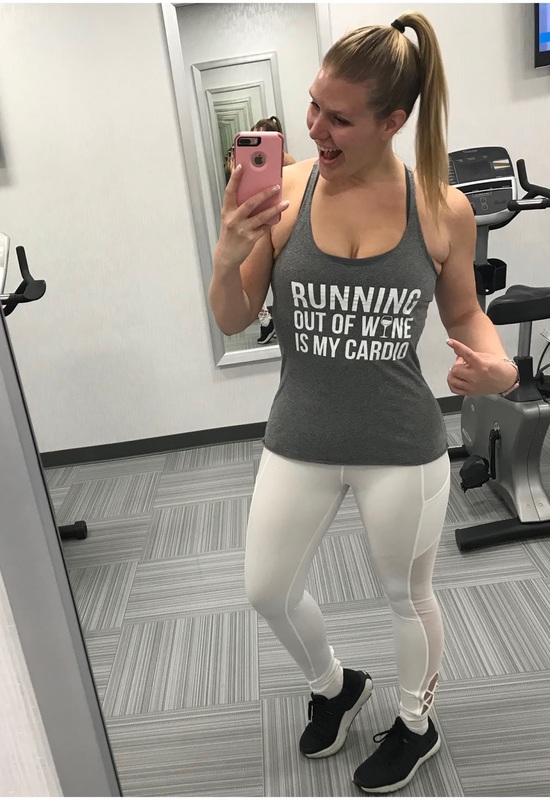 My boyfriend had to sit in on a conference call for work so I made use of the hotel gym while he worked. Obviously I had to wear my wine themed workout gear :) After spending the morning at the hotel we showered up and hit the wine trail! Our hotel was at the very southern most tip of Keuka Lake so we decided to just drive around Keuka Lake to do tastings on Friday as it is one of the smaller lakes: total driving time around the whole lake is only about an hour. Our first stop was at Bully Hill Vineyards. 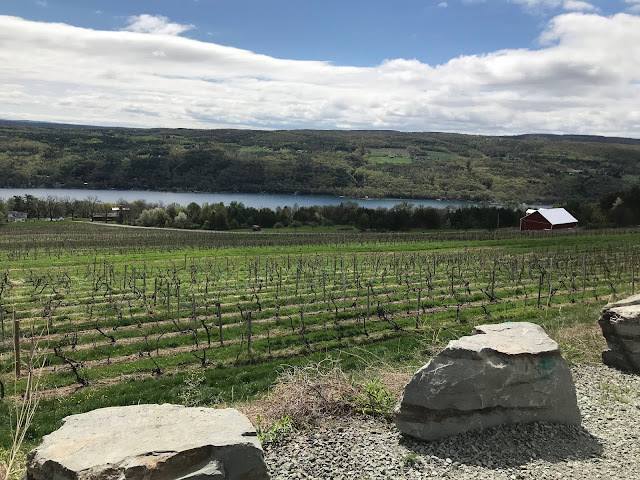 This winery sits pretty high up on a hill and has BEAUTIFUL views of Keuka Lake. For tasting here, you can pick any of their wines to taste for $1 per tasting. They are a pretty large winery and have a pretty extensive wine list. 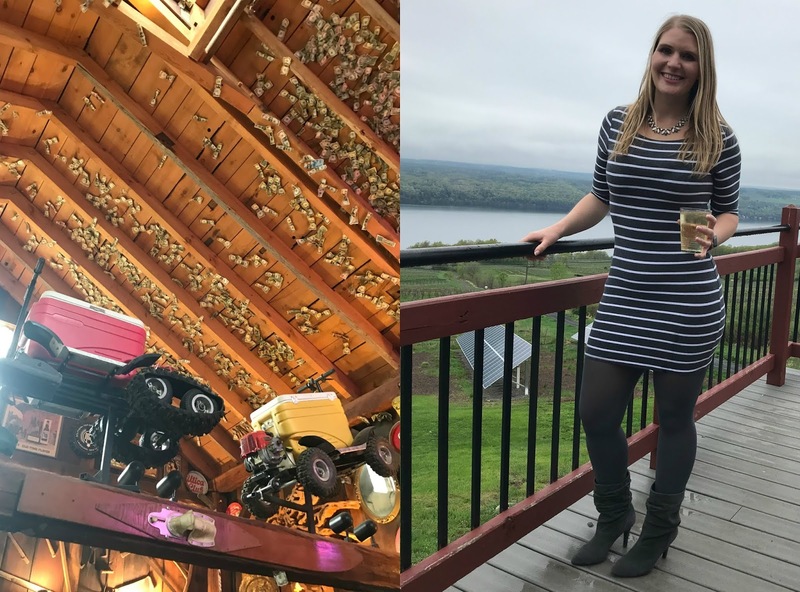 This was my second time visiting this winery and while it's a fun and quirky little spot, the wine really didn't blow me away and I don't think I would go back. You can get a few different kinds of their wines in PA Liquor stores as well - they distribute to surrounding states. It was literally only a 10 minute drive from our hotel though, so it was a quick and easy first stop. 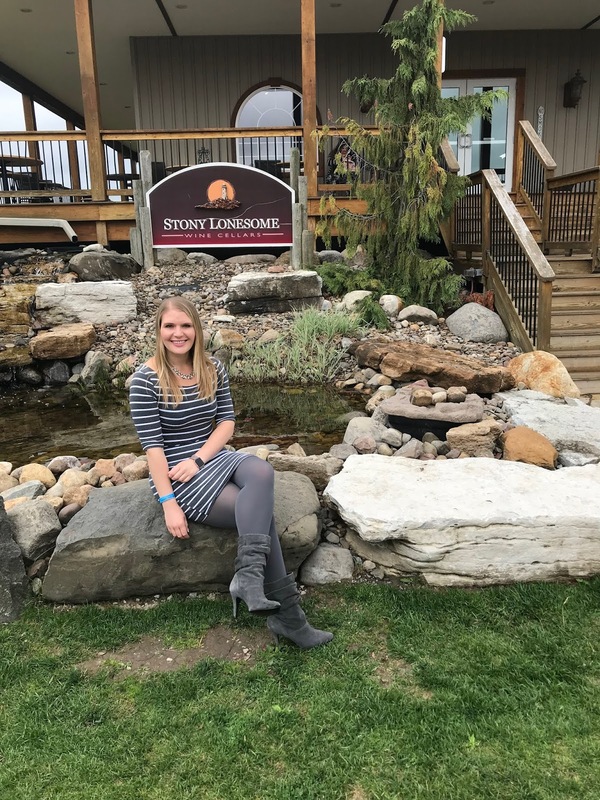 Second on the list was Heron Hill Winery which I would DEFINITELY recommend adding to your list! The tasting room itself is gorgeous - driving up to it my boyfriend said it looked like the Taj Mahal of wineries. During the peak season Heron Hill offers specialized "tower tastings" up in the tower of their winery which offers beautiful views of the lake. It was a little chilly the day we visited so we opted to do the tower tasting indoors - but still stopped by the tower to enjoy the views for a little. 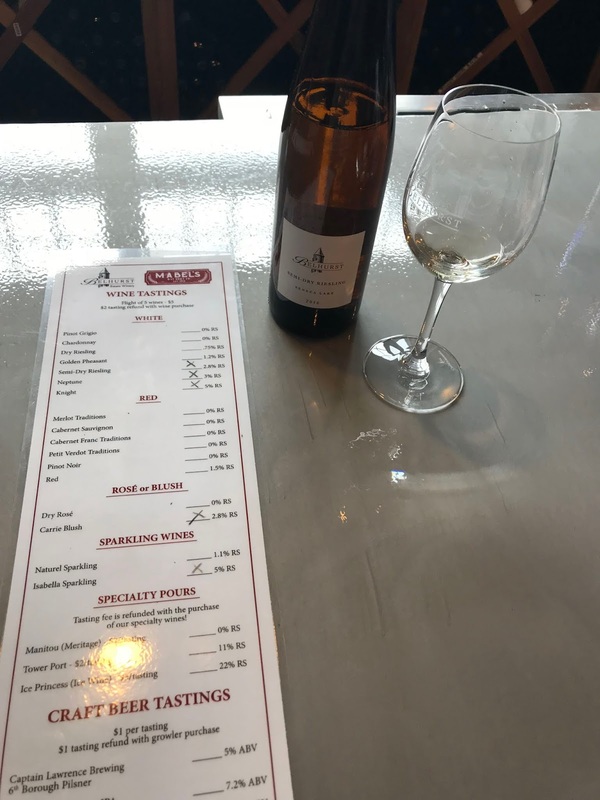 I would totally recommend paying a little extra for this specialized tasting experience: I feel like I learned more about wine in this 45 minutes tasting than I have in my whole life - ever! 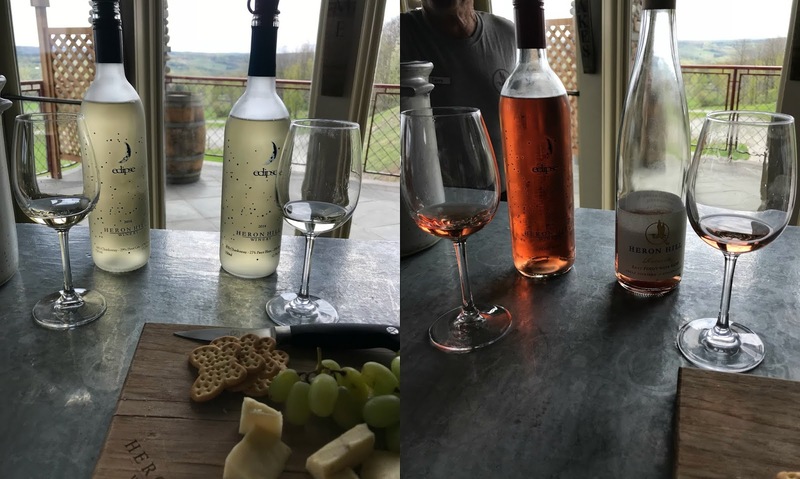 One of my favorite parts of the tasting experience was that they opened two different years of the same kind of wine so you could taste the difference of how the weather impacted the grapes during the growing season and how that resulted in a slightly different flavor of wine from different year releases. 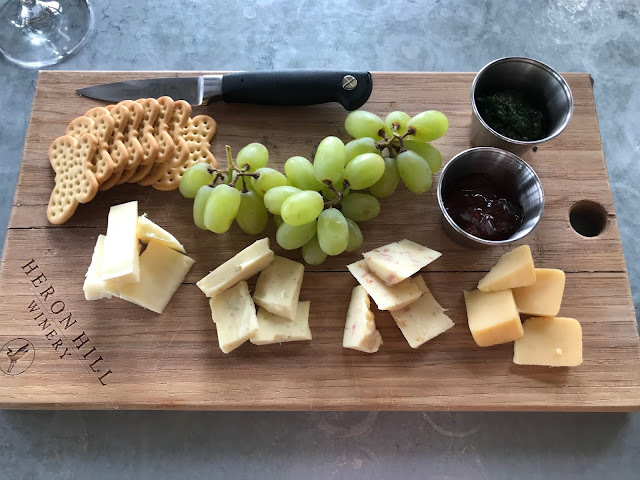 We also were able to pair our wines with a cheese board that featured cheese and jams from local farms. It was all seriously SO GOOD. We completed the formal tower tasting and then our winery guide Terry was nice enough to let us sample a few other wines and even a hard cider that the winery produced. It's amazing how much knowledge he had about each wine: he even sampled a few of the vintages with us because it was literally part of his job to know how each different variety tasted. Perk of the job for sure! I feel like I'm pretty easy to please when it comes to wine: give me something semi-sweet and I'm good to go, but my boyfriend is a little more picky. He absolutely loved all the wines here though and we walked out with about a case of wine to take home with us!!! Next on our way around the lake was at Dr. Konstantin Frank. Whenever I asked for recommendations of where to visit in the Finger Lakes, Dr. Franks ALWAYS made the list. 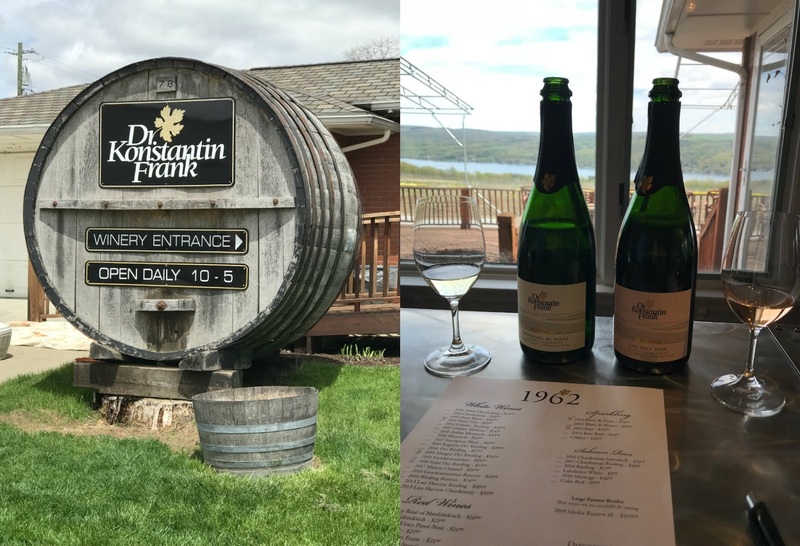 Dr. Frank made a huge impact on the science behind how wine is grown in the Finger Lakes back in the 1950s and really played a major role in shaping the Finger Lakes into a world renowned wine growing region. The wines here are outstanding and the winery staff are extremely knowledgeable on each wine and the industry itself. I really enjoyed tasting some of their sparkling wines and they also have a "value" or house brand of wine called "Salmon Run." The Coho Red is only $10 a bottle and one of my favorite wines from the entire Finger Lakes area! Definitely make sure you visit this spot if you make it to Keuka Lake. After 3 wineries stops we decided to switch things up and stop at a brewery: Steuben Brewery. This was a smaller Brewery but had a a nice tasting room (complete with free popcorn! It's the little things that make me happy...) and they had a variety of beers to taste from but also offered wine and cider from other wineries/cideries. They had a deck out back that once again had fabulous views of the lake. 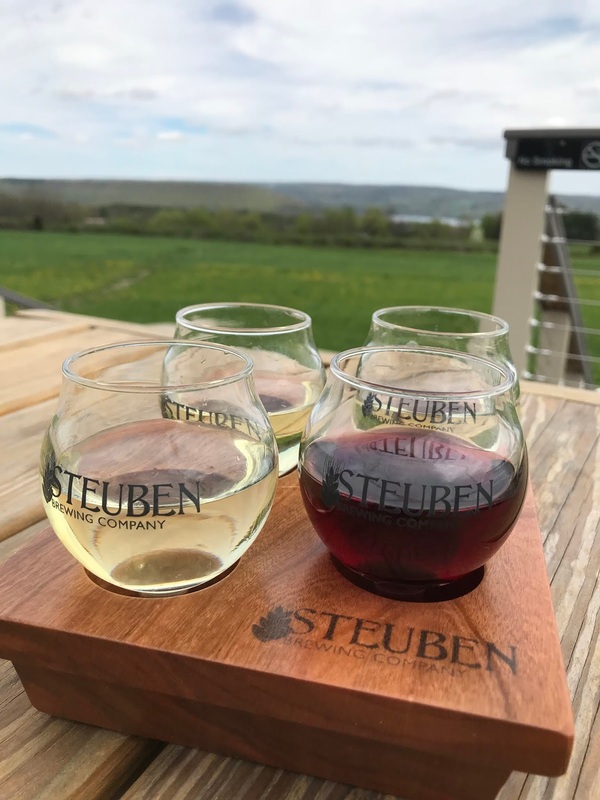 Often on the weekends Steuben brings in food trucks and has live bands playing: I think it would definitely be worth a stop later in the summer when it was a little warmer to hang out on this deck and listen to some tunes for a bit! They offer a flight option for tasting the beers or you were able to purchase full glasses. I did a flight of wine to sample but it was still served in these cute little beer sampler glasses. The next winery we stopped at was Keuka Springs Vineyards. This is at the very top of Keuka Lake in one of the largest towns on the lake called Penn Yan. This was my second visit to this winery and I really enjoy a lot of their wines. I opened up a bottle of their Vignoles just about a month ago that I had been saving from my very first trip to the Finger Lakes in 2014 and I was just blown away by how good it was. I knew I had been saving it for a reason!!! I had to buy another bottle while I was there of course. Once again: this winery had amazing views of the lake and is worth a visit for sure. By the time we were done here the restaurant across the street, "The Switz" had finally opened so we popped over for a late lunch/pre-dinner snack haha. Between a huge breakfast at the hotel, the cheese board at Heron Hill, and various pretzel/popcorn/etc. freebie snacks at each winery we actually were not too hungry for lunch. If you plan a trip to the Finger Lakes off-season, make sure you double check the hours for local restaurants! Since this was a Friday, and not a weekend day, this spot didn't open until 4PM for the off-season. We each had an appetizer and hung out for a bit: it seems like it would be a fun spot to visit for dinner during the summer. They have outdoor seating right on the water and the staff was super friendly. Finally, we headed back to our hotel before ordering a local taxi company to take us out to dinner to get some REAL food. Another thing to note about the Finger Lakes: there is no uber!!! So designate a DD to take it easy at the tastings (like my boyfriend did for this day) or hire a car service. We ended up going back to the town of Bath to eat at the Liberty Street Pub (the place we tried to find Thursday night!!!) and they had REALLY good food. And good company! The owner of the restaurant covered some of our drinks (since we had met him the night before) and we hung out for awhile before heading back to the hotel and gearing up for our second day of wine tasting. On Saturday we had plans to do a bit more driving so I arranged for us to have a driver through Main Street Drivers. This service was recommended by our hotel and I am so glad we booked it. It was about $42 an hour to have our driver, Steve, come to our hotel and then drive our car around to the different wineries. Since he drove our car it was much cheaper than having a car service and then no one had to worry about how many tastings they had done before driving again. 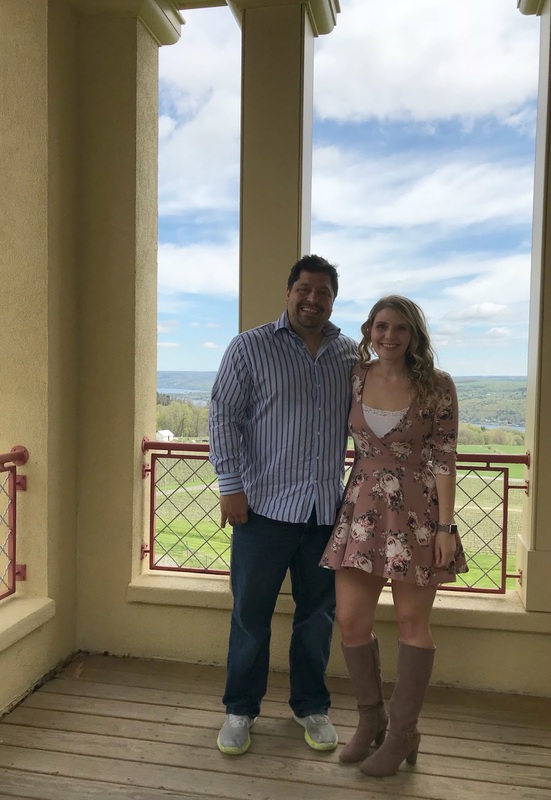 Steve was born and raised in the Finger Lakes as well so he had a great general knowledge of the area and was even able to get us free tastings at some of the wineries on our tour! 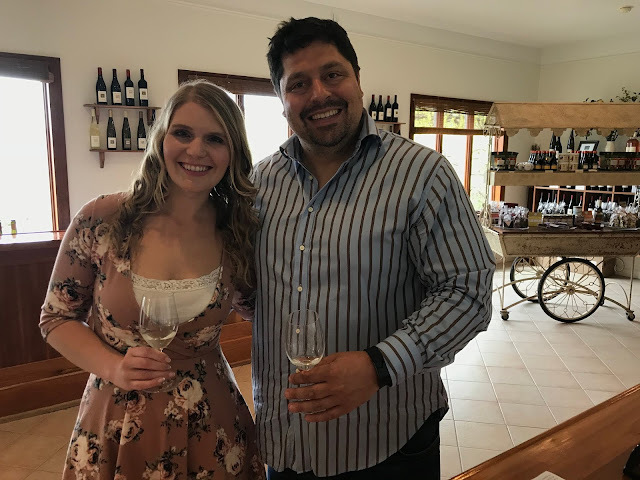 I would totally recommend arranging for this service if you want to fit in a bunch of tastings and not have to worry about driving - it was well worth the money and Steve was really friendly and made the day really fun! 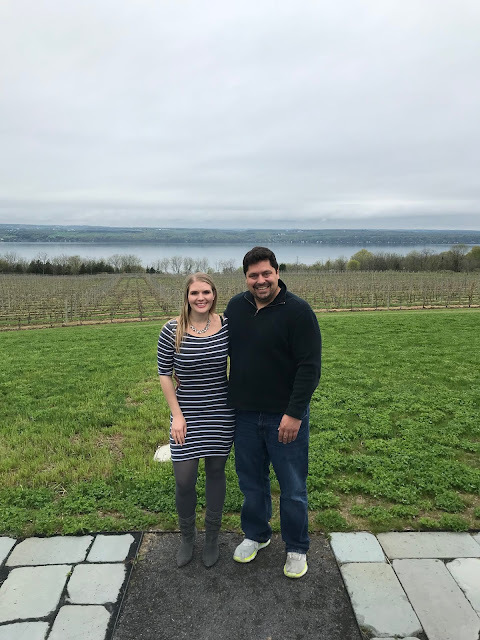 We had Steve meet us at our hotel Saturday morning and then he drove us about an hour away up to the top of Seneca Lake which is to the East of Keuka Lake. Our first stop of the day was at Belhurst Castle which features a hotel, restaurant, salon & spa and winery and a few brews as well. It really is located in a castle which made the visit pretty neat! I had heard about this place from a friend who went to a wedding here one summer. I did a tasting of their wines while my boyfriend started his morning off with a tasting of their beers. It was a pretty quick stop but I bought a bottle of one of their sparkling wines which I though was deeeelicious. Next on the list was Three Brothers Winery. 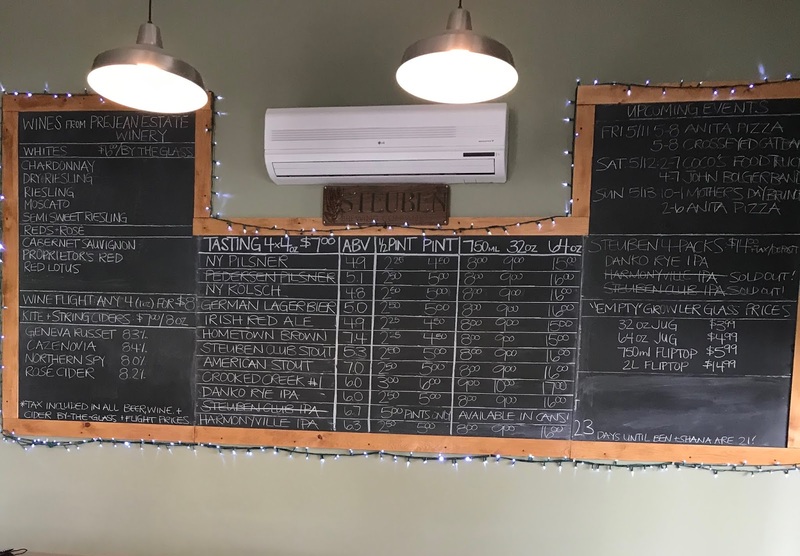 This was my third visit to Three Brothers and I love coming here because they have three different wineries AND a brewery that you can visit all on the same property. They also have a cute gift shop, wine slushies, and a coffee house and mini cafe. It's a great spot to visit and hang out for a bit. Plus their Estate Chambourcin from the Stony Lonesome wine cellar just may be one of my favorite wines EVER. I bought 6 bottles while on this trip! The other two wineries on the property feature VERY sweet wine (some of them are almost too sweet for me!) so we did one other winery tasting and then skipped over to the brewery. 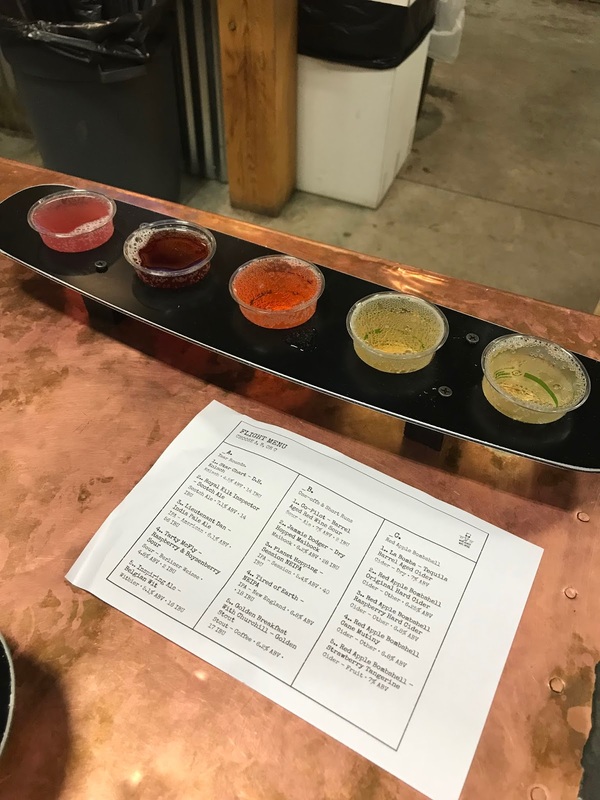 They recently changed how tastings are done at the brewery: you can get one free drink of your choice which is included in the price of your tasting passport to Three Brothers as a whole OR you can pay an extra $5 and upgrade to a tasting flight. We chose to upgrade to the flight and I think it was well worth it: you could pick between two different beer flights or a hard cider flight (what I got!) and there was a really good serving size of each drink. 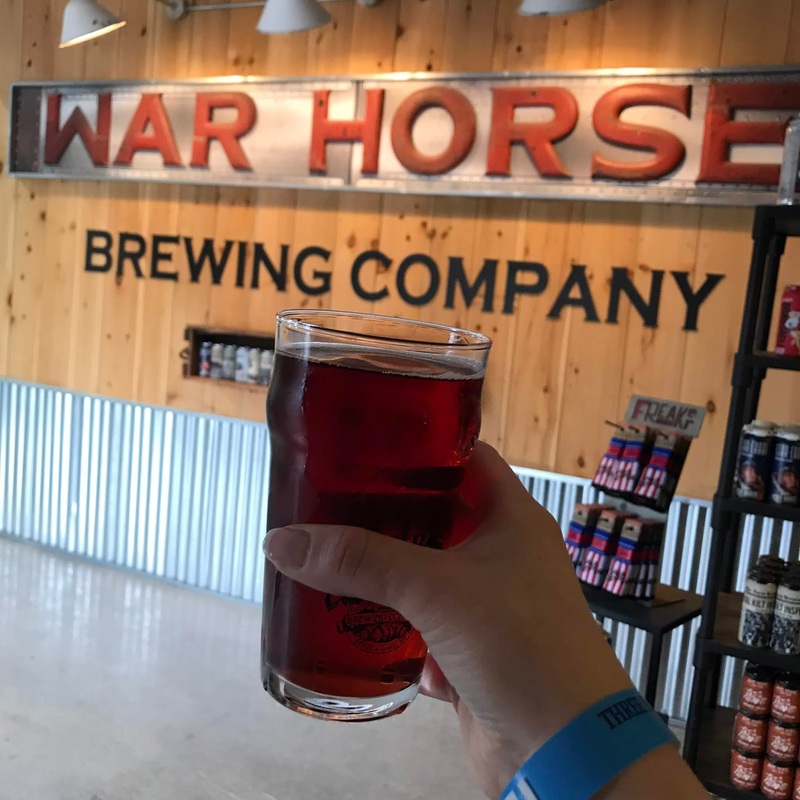 War Horse is the official name of the brewery and we ended up hanging out here for a bit. There are a TON of people who come through Three Brothers on the weekend, so it's a great spot to order a glass of beer (or the Red Apple Bombshell Cane Mutiney Hard Cider for me!) unwind for a bit, and do some good ole fashion people watching. After Three Brothers our driver recommended stopping at Boundary Breaks Winery. 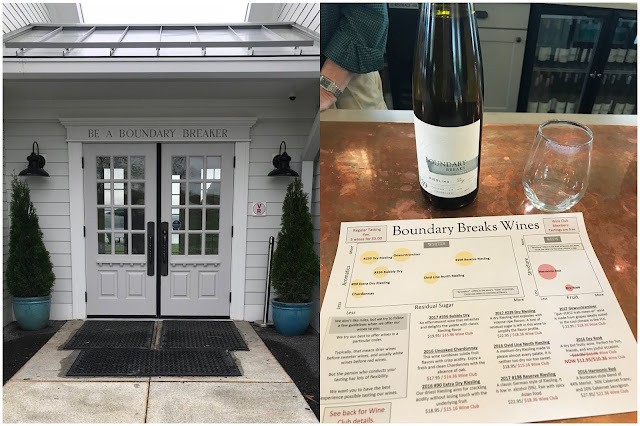 I had never heard of this winery before but they were supposedly well known for their Riesling wines (as so many wineries are in the Finger Lakes!) I really enjoyed the tasting here and actually surprised myself by thinking some of the Riesling's they labeled as "more dry" still had a decently sweet flavor. I guess my tastes are finally changing a bit with wine! I bought two different bottles of Reisling here which I'm really looking forward to opening. 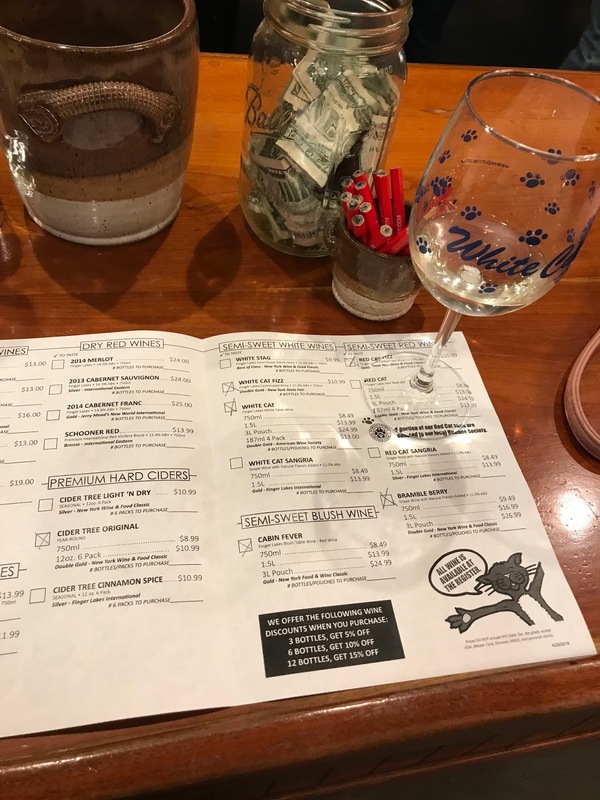 It was a very friendly little tasting room (complete with winery pet dog - it's a very pet friendly winery!) but the most stunning part of this spot was the view from right outside the tasting room. They had a nice outdoor set up with fire pits and chairs - if it would have been a nicer day this would have been a perfect spot to hang out for a bit and enjoy the scenery. Due to timing and location we just ended up grabbing lunch next door to this winery at the Ginny Lee Cafe. I would definitely NOT recommend eating here. The service was really slow and the food was just mediocre at best. Since we were visiting in the "off season" we had issues with some places not being open for lunch yet, so after doing 4 tastings already we really just needed to get some food and this place was convenient and worked in a pinch. After lunch we kept making our way down the south side of Seneca Lake and visited Hazlitt winery. This was actually my third time vising Hazlitt (we got a free tasting thanks to our driver!) and it's always a fun stop. 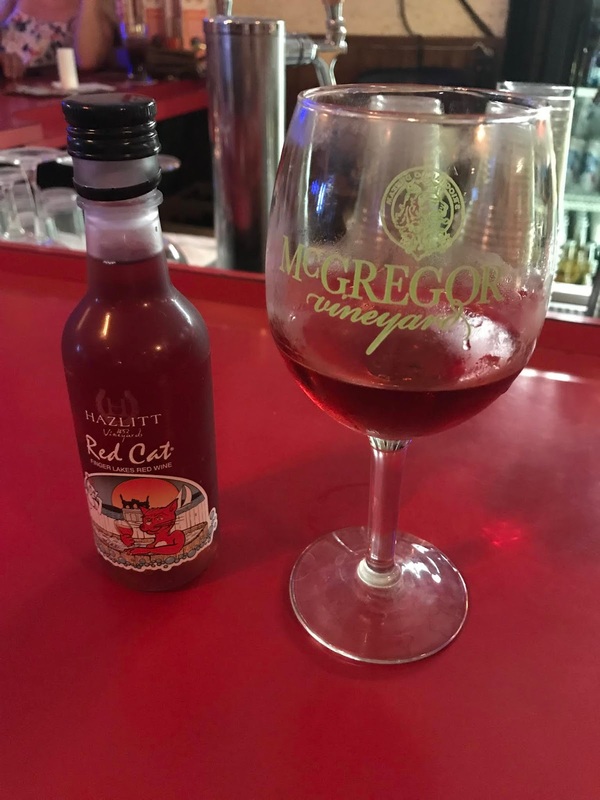 The Red Cat wine that I drank the very first night of our trip comes from Hazlitt! They are a pretty decent sized winery and you can find some of their wines in PA liquor stores. They have a good amount of sweet and fruity wine, and in the summer time they open up the "Oasis" which is an outdoor bar and spot to hang out. 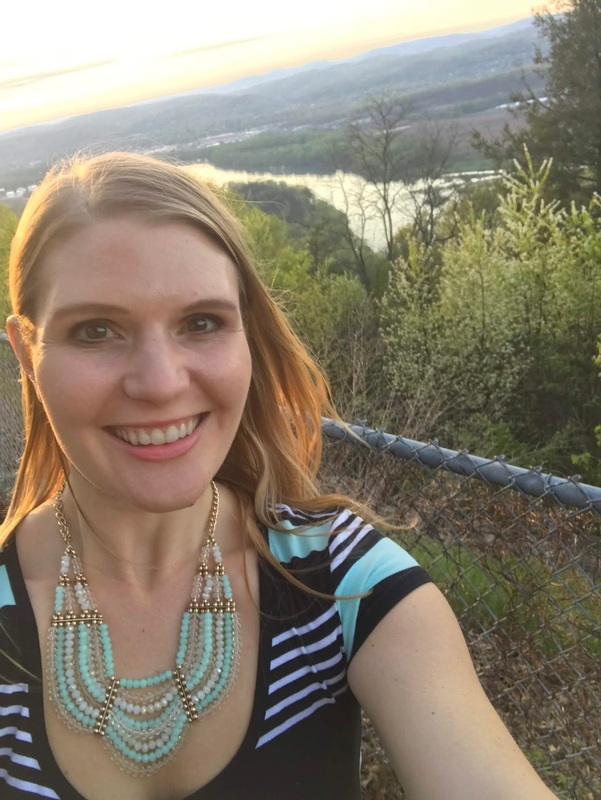 We went to one of those events on our last trip to the Finger Lakes when they had food trucks and a live band playing - it was really fun! Not much stays open past 5/6PM in the Finger Lakes, so if you can plan ahead to attend one of the Friday night events at Hazlitt I would recommend it. Next winery was Atwater Vineyards: we visited this spot last year after their formal tastings were closed because during the regular season they stay open until sunset and serve wine cocktails on their deck which has AMAZING views of the sun setting over the lake. This time is was nice to come back while the winery was still open to do one of their formal tastings. My favorite wine they have is a Bubble Riesling: they serve this mixed with a peach purée as a yummy peach bellini cocktail on the deck. Had to buy another bottle of this to bring home! We made a quick pit stop after Atwater to Two Goats Brew Pub because our driver really recommended it. They had a lot of interesting beers to pick from for any beer lover - but they also served cider from Hazlitt winery which I got. I really like that the different venues in the Finger Lakes all try to support each other and serve local drinks and food whenever possible: it really is a nice community of people and businesses promoting each other! This was a small spot but it was PACKED when we stopped in - so obviously well liked by locals and tourists alike. The ceiling is also covered in money that is thrown up and sticks to the wood ceiling...there was some story behind it that our driver told us...but the exact details of it are escaping me haha. It was a cute and quirky little spot for sure though with a nice deck and lake views outside. Our last winery stop of the day was at the very bottom of Seneca Lake at Lakewood Vineyards. 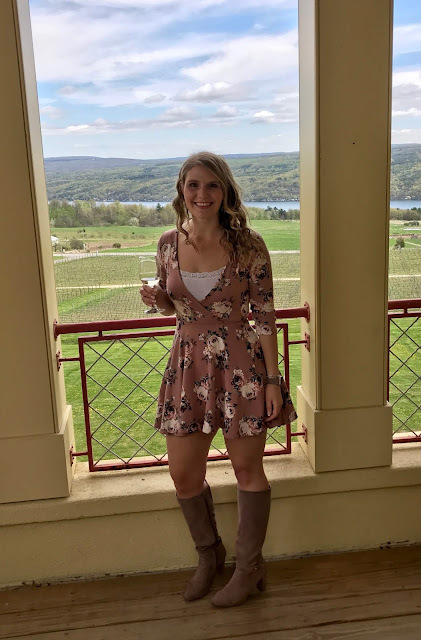 There were BEAUTIFUL views from this tasting room and the wine was delicious! You could choose from a sweet flight or a dry flight and we did an extra tasting of their port wine which was fabulous as well. This place was BUSY - maybe the busiest winery we visited all day and obviously the wine was worth it! Lakewood was our last winery for the day so after that Steve drove us back over to Keuka Lake and dropped us off at our hotel. Conveniently enough, the Finger Lakes Brewing Company was located right next door to our hotel and had live music playing Saturday night, so we popped over to hear some of the music and so my boyfriend could try their beer. Luckily enough they also served wine from Heron Hill and they had a cider as well so I was a happy camper. The band was really good here so we hung out for a little while and then we literally ran into a neighbor of ours from Pennsylvania alllll the way out in random Hammondsport, New York. We literally live in a small town-home community, maybe 35 homes total, and ran into a neighbor from down the street! We only kind of knew this neighbor before, but then ended up hanging out with him and the friends he was visiting the Finger Lakes with for awhile. It was such a fun night! We ended the evening getting dinner right in town at Burgers and Beer: one of the few places in town that stays open late (10PM). 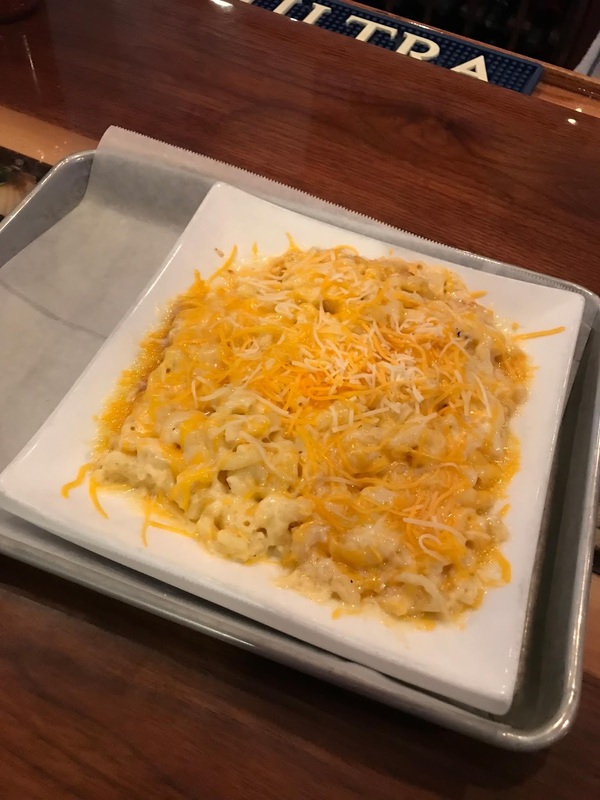 They had a lot of really yummy looking burgers on the menu, but after a full day of drinking wine and cider I saw mac and cheese on the menu and said GIVE ME THAT haha. Total comfort food but exactly what I wanted. The town of Hammondsport definitely has a small town vibe: we sat next to the owner of the only grocery store in town at this restaurant and he kept pointing out who all the other patrons were from various other local businesses in the area. Everyone was so friendly and seemed to know each other but definitely welcomed us in! We had considered doing some hiking at Watkins Glen State Park on our way out of town on Sunday, but the weather was kind of crappy so Sunday morning we just packed it up pretty early and headed back home. I think for our short trip we brought home a good amount of souvenirs though!!! Even though it was still slightly in the off season and not the warmest out, it was still a FABULOUS trip! I would go back and do it again in a heartbeat :) I think ultimately what I would like to plan next would be a longer trip during next summer: instead of just doing a long weekend I would try and find another couple to come along joint with my boyfriend and I to split an Air B & B or a VRBO right on the lake. That way we could split our time between doing some more recreational activities on the lake, wine tasting, and doing some more cooking/relaxing around the house as well. 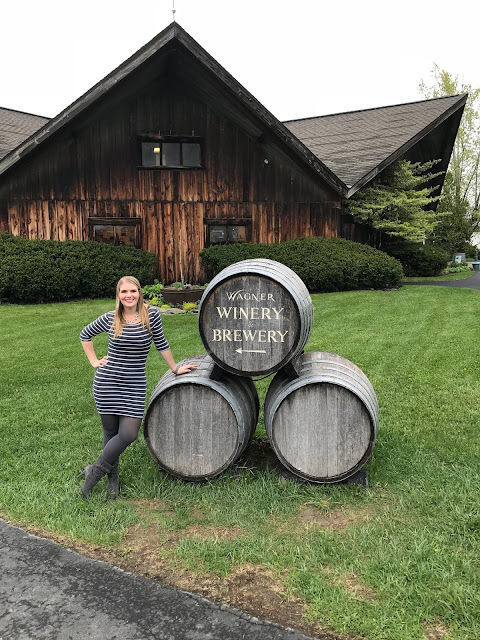 If you love wine though and want to squeeze in as many tastings as possible though...I feel like our itinerary is a good one to start from for planning your own trip! wow, this place is awesome. i like this place.